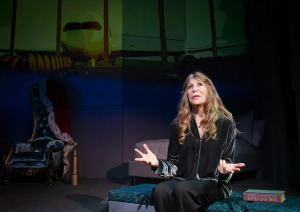 I’ve never had so much to say about a one-woman show before, but this one requires it. People think I’m joking when I tell them that I can run the Beauty Queens category on Jeopardy. But I really pretty much can. As a child, I was fascinated with beauty competitions, and am still the only person I know who not only watches them, but seeks them out to make sure I don’t miss any of it! In all honesty, I used to watch these contests out of support and admiration for what were always pretty, smart, and talented young ladies, but now I watch mostly to ridicule the proceedings. It’s fun, either way. 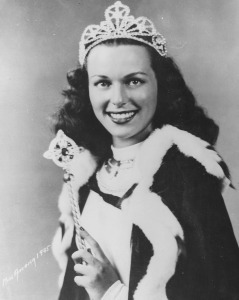 Bess Myerson. Photo courtesy of Pageant Productions. But I can still tell you all about many of the Miss Americas going back to way before my time! But, since she put it right in the title of her show, I do sympathize with the plight of Bess’ only child, Barra Grant; it could not have been easy being the daughter of a stunning, world-renowned woman. Barra Grant. Photo by Darrett Sanders, as is the big one at the top of this page. Which might have been her raison d’etre for writing this show. This woman really hates her mother! 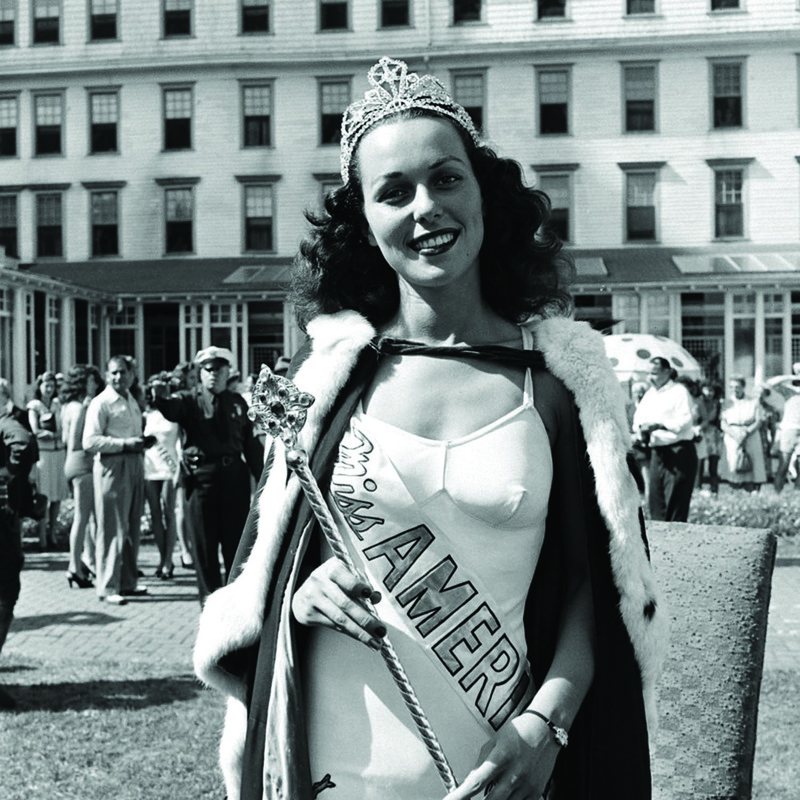 Miss America’s Ugly Daughter: Bess Myerson & Me is the Jewish Mommie Dearest! And that made it hard for me to watch. This experience was more like witnessing someone’s therapy session than seeing a theatre show. This poor woman is like an open wound, so it’s hard to review it as an entertainment; I feel like I’d be reviewing someone’s personal pain, which just isn’t right. I feel bad for anyone who is the grown-up age that Barra is, and has only bad memories dating back to childhood. She needs a hug more than a review. Since this presentation is akin to therapy, I’ll get into the psychoanalysis of it in a minute, but first I have to tell you about Miss America’s Ugly Daughter: Bess Myerson & Me as a show. I laughed only two times, and my young friend not at all, but the older opening night audience seemed to really enjoy it. Perhaps they were experiencing a bit of schaudenfraude. The one-act is a comfortable eighty-two minutes. But the tales of woe are sort-of hard to listen to. It appears that Barra found no redeeming qualities whatsoever about her mother. And, without Bess here to defend herself, I don’t know what to believe. Bess Myerson with baby daughter Barra Grant. At least Barra looked up to her mother back then! Photo courtesy of Pageant Productions. Barra’s writing is clever enough, but since I was such not a fan of the topic, I just could not get behind the narrative. Perhaps if this tale was about someone who was not famous, I would have felt differently. It would have definitely been easier to listen to the maligning of a nameless, faceless woman, ala Wolowitz’s mother on The Big Bang Theory. On a positive note, even though this semi-monologue depressed me no end, I was glad to finally see someone who thinks the same of a deceased relative as they did when the person was alive. Most people complain about their parents their whole lives, and then make-out like they were saints after they die. So I appreciated Barra’s consistency on that front. And at least she presented as calm on opening night, so that’s a positive. Also on the plus side are the many fascinating projections by Tom Jones; they’re beautiful. Especially the posterized photos of New York. They gave us something interesting to look at along the way. And the post-show outdoor reception was really cute and well-thought-out. It was all foods associated with people of my ethnic persuasion—potato pancakes, mini blintzes, rugelach, and mini-black-and-white cookies. So that part was really clever, and had everyone leaving the premises smiling. Bess Myerson in her heyday. Photo courtesy of Pageant Productions. Okay, so here’s what I have to say about someone vilifying their famous dead parent in public: As the saying goes about differences of opinion, there’s one side, the other side, and the truth. In this case, we’re getting just one side, without the other person being here to defend herself. I’m sure it’s Barra’s truth, but it may not be the truth. We’ll never know without Bess, nor probably any of her friends, being alive to give us her side. And Barra is an only child, so there’s no one to confirm or deny her story. 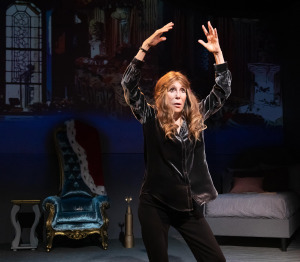 Perhaps even more annoying is the voice portrayal of Bess by another actress, Monica Piper; she’s off-stage during the show, doing phone conversations every now and then. Even though Bess Myerson was Jewish, I cannot picture her ever being the crazy nag that she’s made-out to be here. (Perhaps she really was; I just can’t picture it.) And she definitely did not have that horrible raspy voice, nor the Jewish-y intonation, that Piper is giving her. Research Bess on YouTube, as I just did, if you want to hear her for yourselves. She had a sort-of deep, elegant, non-accented-in-any-way voice, with beautiful speech. If Miss America’s Ugly Daughter: Bess Myerson & Me got this part so wrong, what else does it have skewed? And I really cringed at Barra making fun of a dying ninety-year-old woman forgetting things. On last week’s This Is Us, the wise mother said, “It’s hard to be mad at someone who’s not here anymore. There’s nothing you can do with those feelings.” I guess that Bess Myerson’s daughter did not get that memo. Barra Grant. Photo by Darrett Sanders. Barra Grant says at the end of her show that she had finally “set herself free,” but this sure doesn’t seem like she has. At some point, though, (especially since Bess died over four years ago,) she really should try to get over it. Perhaps a shrink might help more than an audience. If you’re curious, go see it. 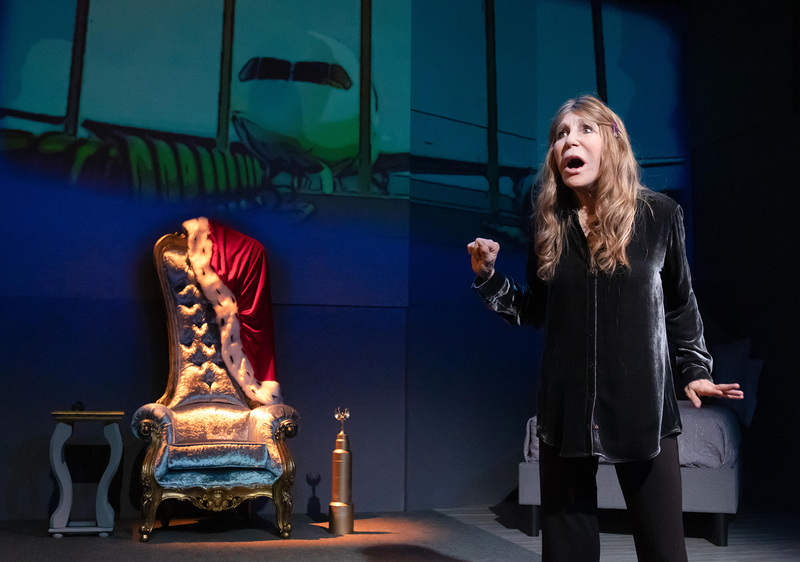 But if you’ve ever been a fan of Bess Myerson, who over her long life did a lot of good for Jewish people, and New Yorkers, in general, this is not the show for you. I wish that I had passed on it. Greenway Court Theatre 544 N. Fairfax Ave.
Love the caption under the pic of Bess and her baby daughter.